Thermal Active Setting Spray is rated 2.3 out of 5 by 41. 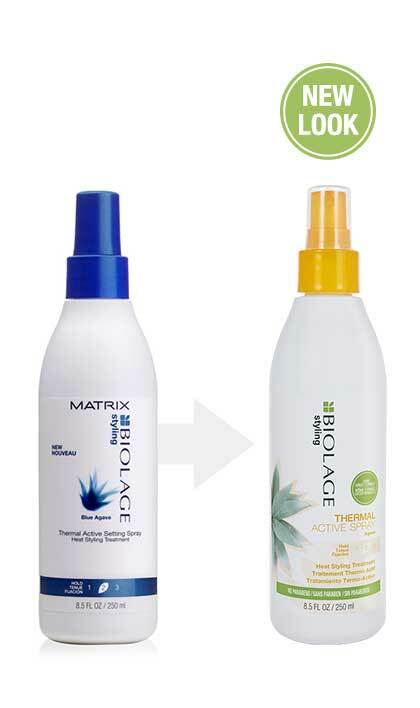 Share https://www.matrix.com/biolage/styling/thermal-active-setting-spray Thermal Active Setting Sprayhttps://www.matrix.com/~/media/images/product-images/biolage/styling/new_biolage_packshots_420x708_thermalactive.jpg Adds body and volume for long-lasting control. Protects against heat for sleek, straigh looks. Spray on wet or damp hair before blow-drying and styling. Can also be used on dry hair with curling iron, flat iron and hot rollers. Rated 1 out of 5 by Marjoree from unhappy I've been using thermal active setting spray for years, the green lid, then the blue lid, and I loved it. The yellow version is not the same and it made my hair very dry. Had to return it. Why do you always have to change formulas when the previous one is much better. Rated 5 out of 5 by Thin Hair Challenged Gal from Best product for my thin hair PLEASE bring this Blue Agave formula back. I have tried (and I'm serious) over 2 dozen products to replace it and none of them do what this product did for my hair when blow drying. It adds fullness and some body without stickiness or weight. PLEASE...I've spent hundreds on other products and none of them work as this one does. My stylist has no great alternative either. Rated 1 out of 5 by DQuick from Not the same! I have used the Thermal Active SETTING Spray for several years and love love love it. However, I recently bought a new bottle - which now reads "Styling Spray" and this is not the same stuff at all. If the recipe changes, Matrix should say so and I could have saved some money. I'm very disappointed. Rated 1 out of 5 by Jenny923 from Makes my hair sticky I love almost all matrix products. However, this is horrible. At first I thought I accidentally sprayed hairspray on my hair. It made my hair sticky, tacky and impossible to slide the hot iron through. Terrible product. I’m so disappointed! This wasn’t cheap either. Rated 1 out of 5 by stevieT from Disappointed - Old Formula Please I recently returned to using this product when I stumbled across a bottle of the original formula. I had forgotten how amazing it was at taking my fine hair, even when it's way too long, and making it look like a thick full head coif of a much younger man. When the bottle was empty, I was relieved to find this was available with the "same great formula." Imagine my disappointment to discover that this isn't at all the same formula that I had been using. What purpose does the Blue Agave serve? As far as I can tell, it ruins the product simply for the sake of listing a currently hip bio-ingredient on the label. Just go back to the original and stick the cucumber, nettles and hemp on the label. They are far more trendy than the agave. 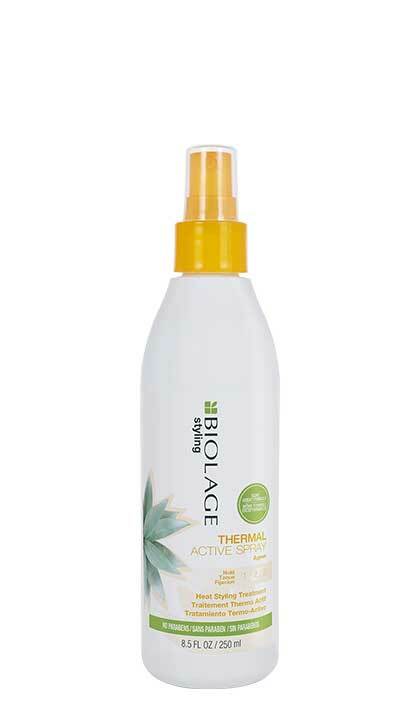 Rated 1 out of 5 by DarlaDenver from Terrible I was for many years a fan of Biolage Bodifying Spray Gel, and for awhile paid the absurd prices on ebay when it was no longer available. Gave my new Thermal Active to a friend to see if I was correct in my assessment of this product. It wasn't just me - she and another of her friends tried it and all of us agree it is a TERRIBLE replacement for the old product. If you want dry brittle or sticky awful hair, use this. It'll attract friends, like moths and bees and flies. Why won't Matrix listen to all the negatives and bring back the old product? While they're at it, they need to redesign the bottle. I always decanted it into something else, because this ought to be called "drop gel" because the bottle design is such that you can't hold on to it. Rated 1 out of 5 by dcohen07 from TERRIBLE I just bought this and was excited to use! However it made my hair so hard/straw-like and TANGLED. It literally hurt to blow dry and straighten my hair bc it was hard and knotty. And that is not my hair type. I am returning this for a refund tomorrow. Hopefully I get my money back bc this was expensive. Rated 2 out of 5 by KarenC from Original formula was much better! Please bring back the previous formula. This one doesn't work for me. I have fine hair that only curls with hot rollers. The previous formula helped hold my curl all day. Current formula does next to nothing. I do not need protection from heat so the other product you have recommended to others is not something I am interested in.